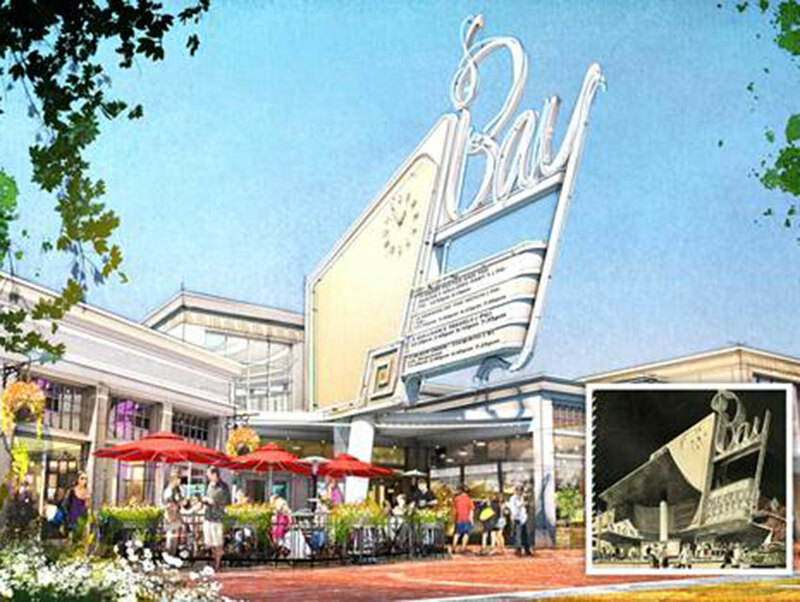 Bay Theater rendering proposed for the next chapter of Swarthmore Avenue, inset with a historical Bay Theater rendering dug up from architect S. Charles Lee that was originally intended in 1948. Caruso Affiliated recently purchased nearly 3 acres of property on Swarthmore Avenue zoned for commercial use. Now we know why: The developer behind the Grove and other mixed-use neighborhood projects announced last night plans for a Palisades Village project that will include “charming storefronts oriented around a main street and neighborhood green.” According to a press release, the future destination, set to open near the end of 2017, will feature a mix of specialty retailers, restaurants, a grocer, a five-screen movie theater, and lots of additional neighborhood parking. One priority listed by Caruso’s team? To “create an organic look that fits harmoniously with Pacific Palisades.” Sounds expensive—but you know, casually so.